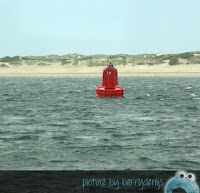 Texel is an island, so of course it is surrounded by sea. There are even two seas surrounding the island. On the west coast there is the North Sea. The east coast of the island gives you a breath taking view over the Waddensea. You can swim and play in both seas, but the beaches are on the west coast of the island though. 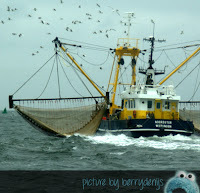 The Waddensea is more used for fishing and such. You can make all kinds of cruises and educational trips per boat on the Waddensea. 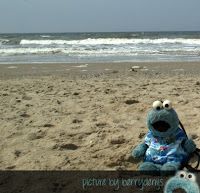 If you like to go to the beach, Texel is a treat, because there is 30 kilometers (that is 18,64 miles!) of beach to choose from. That is a lot of sand and beautiful scenery to enjoy! Some are more quiet, some are more popular, but all are numbered to keep them apart. Every beach entrance is called by the kilometer pole that is standing there. The numbers correspond with the kilometer mark that is used by the Government. 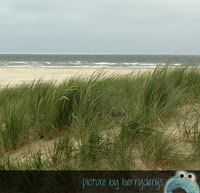 If in example you visit the beach at Paal 9 (pole 9) you visited the beach at Den Hoorn. 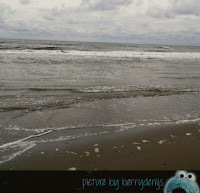 It is also the 9th kilometre of the beaches in Texel. Me went to Paal 17 near ecomare, Paal 21 at De Koog (the town me stayed) and Paal 33 at De Cocksdorp where the Lighthouse is. Me thinks Count von Count will like that very much too. Every beach is different. They all have nice diners though. Some have beach houses for rent, where you can change into your bathing suit or clothes and lock away your valuables. 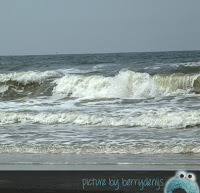 Some beaches are great for surfing so on those you can find surfschools. 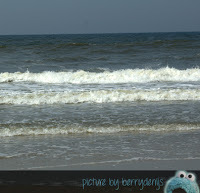 Some beaches are absolutely nice to sunbathe, others are great for taking long strolls or play with your dog. It is awesome. Also there are guarded and non-guarded beaches. That means some are with and some are without lifeguards. 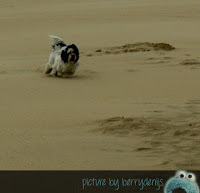 This is probably why Berry loves Texel so much: dogs are allowed on every beach! Okay, every beach has its own house rules stated neatly on big bulletin boards at the entrance of the beach, but on every beach you can enjoy your time with your furry four legged friend. That is very special, because not all beaches on the mainland of the Netherlands allow dogs to accompany you for a day on the beach during the summer season. On the island the main rule is that on guarded, touristic beaches you should keep your dog out of other people’s business and on a short leash. On the non-guarded beaches dogs are allowed to run freely off their leash. Our Sammie had so much fun! 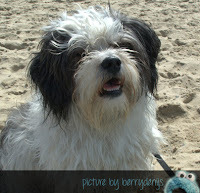 He even got his paws wet in the ocean on two different occasions (and beaches). Dogs are also allowed to accompany you at the beach diners. They even bring a bowl of water for your furry friend when you order a cup of coffee or a soda. Nice huh. Me loved that. Well, that concludes part IV of me Vacation blogs about the island Texel. What do you think? Maybe they can give me a job at the Tourist Information Center? Well, see you next week!